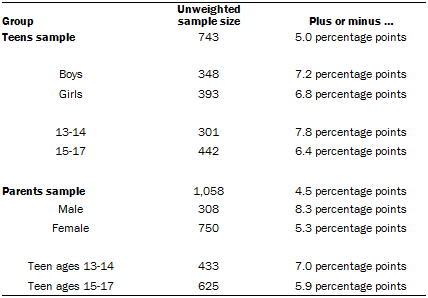 This particular survey featured interviews with 1,058 parents who belong to the panel and have a teen ages 13 to 17, as well as interviews with 743 teens. Parents who have multiple teenage children were asked to provide information about each of these teens. The panel then randomly selected one teen, for whom parents were instructed to respond to all survey questions. Interviews were conducted online and by telephone from March 7 to April 10, 2018.